Rabbi David Stav, head of Tzohar, notes that independent conversion committee will strengthen Israeli Jews by preventing assimilation. 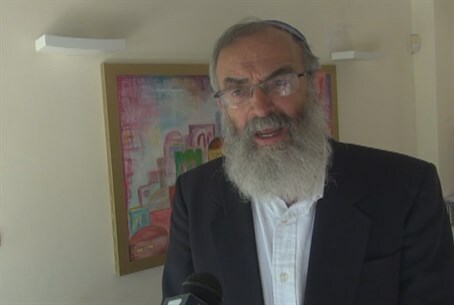 Rabbi David Stav, head of the Tzohar organization, defended the move to establish an independent conversion court on Tuesday, in a special interview with Arutz Sheva. Rabbi Stav noted that "tens of rabbis" from prominent yeshivas [Torah academies - ed.] formed the initiative, which is designed "to confront the assimilation" rampant throughout Israeli society. "We have almost 100,000 kids that have to be converted," Rabbi Stav stated. "We have here, every year, more than 4,500 kids that are born and less than 2,000 converts per year." "These minors are involved in Israeli society," he continued. "They go to Jewish schools, they go to university, they serve together with us in the Army - and they will have no other choice but to get married to their Israeli colleagues." "If we want to prevent a high percentage of intermarriage among these youngsters, the only way [...] is this initiative to run these rabbinic courts." On Monday, a group of rabbis from Tzohar and other moderate Orthodox organizations declared an independent conversion body to address the long bureaucracy hindering the conversion process. The group expects the majority of those it converts to be the children and grandchildren of families of immigrants from the former Soviet Union, it noted in its announcement. Although they are Israeli citizens, many of these children are the products of “mixed marriages,” with their parents marrying in the Soviet Union and immigrating to Israel. Most of the children speak Hebrew fluently and serve in the IDF. The decision has faced mixed reviews, with harsh criticism from the haredi sector - which largely controls the Rabbinate - and praise from non-Orthodox groups. The Religious Zionist world appears to be split on the matter for the time being, with some authorities for the decision, and others against.